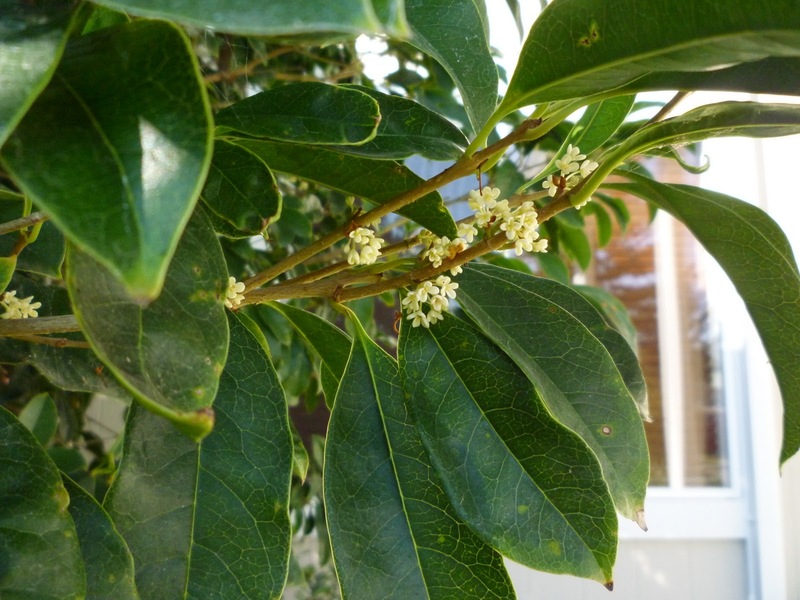 When Debbie at Artful Aspirations posted about her sweet-smelling bush, I suspected a near relation, perhaps even a twin, to my Osmanthus fragrans. 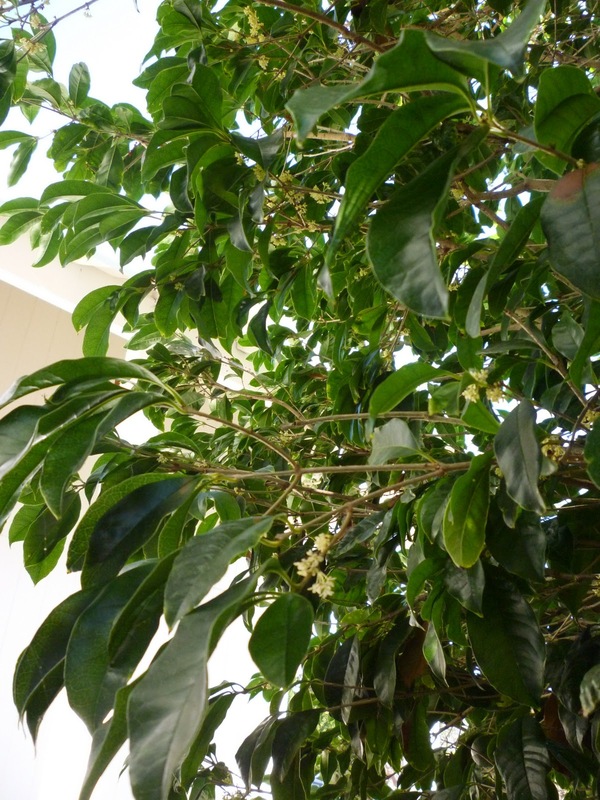 She said she bought her plant because of its common name Tea Olive; I had only known mine as Sweet Olive. Not many days later M.K. at Through a Glass, Darkly, who was not a follower of Debbie’s blog, posted photos of her “holly bush,” with descriptions of its “heady and rich” scent reminiscent of gardenia. The challenge of describing various scents is always of interest to me. I wonder if an individual flower is easier to pin down than a whole rain forest. We usually have to say that any given smell is something like another. 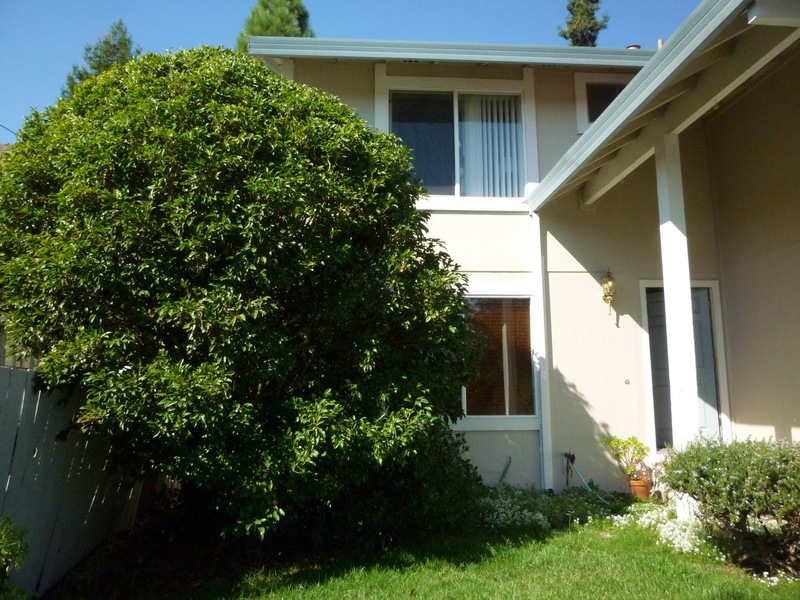 Having grown up in an orange grove, I didn’t confuse osmanthus with orange blossoms, but upon my first encounter I did envision some woman along the route of our neighborhood stroll setting an apricot pie to cool by the window. Surely osmanthus is its own heady aroma that nothing else is quite like. Last year, at the end of a post about how various other scents link to my grandmother, I tried to describe its effect on me. Peet’s has blended a black tea with osmanthus blossoms, which might add some extra excitement to those mornings when I choose it over plain black or green.They say “its pleasant aroma could be described as a combination of apricot, chamomile, and orange flower.” They don’t make it all year long; stocking up would be necessary if you want to be assured of having it when you want. After she heard about osmanthus, M.K. began to wonder if her hollies might actually be Tea Olives. In the meantime I had been reading about fragrant holly bushes and found that there are hundreds of types of holly, and some of them do look a bit like osmanthus. One osmanthus looks so much like holly that its common name is False Holly. Wikipedia mentions that osmanthus flowers can be various colors, even dark orange, and that in China it is traditional to mix some osmanthus jam into millet gruel. 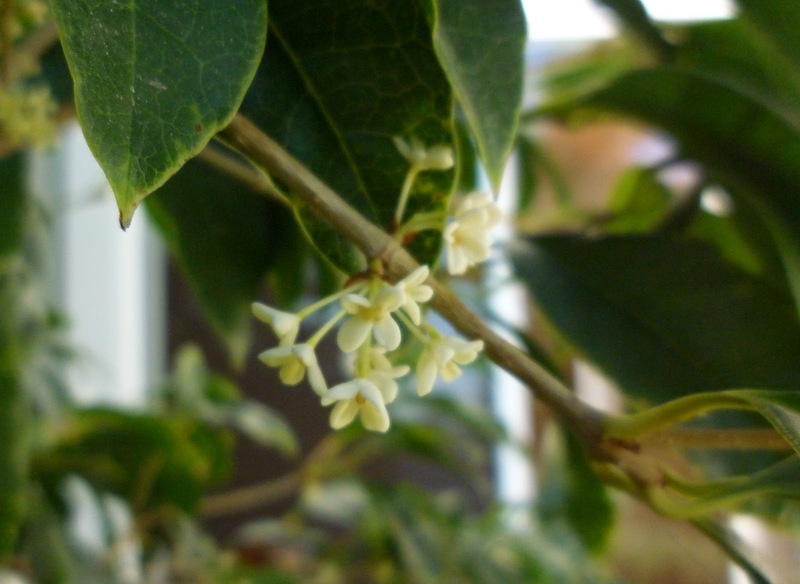 You can see on that page a photo of an orange-flowered osmanthus taken in Japan. All of the photos here on my blog were taken just this week in my yard. B. and I planted the bush about 20 years ago on the advice of horticulturist friend. If we had known how big they get, we’d have started it out farther from the house. Wikimedia also has this whole page of related photos. Some of my other favorite botanical scents are lemongrass and rose geranium. I have a big bush of the geranium in a pot on the patio, and in my cupboard some essential oil of lemongrass to add by drops to hand soap. So far I’ve only enjoyed my osmanthus when it happens to fill the air with its essence, and that occasion always takes me by surprise and humbles me by the extravagant gift. “The osmanthus is blooming!” I will announce, if someone is around. This happens at least twice a year; do I really need the oil extraction at other times? The people on the planet of Perelandra in C.S. Lewis’s novel by that name had an admirable way of making the most of every experience. They considered an actual event in time to be only the smallest part of anything that they did or that happened to them. The anticipation was also to be enjoyed for all it was worth, and the memory of the incident or act would be savored into the future. In this way even the most lovely and desirable events were completely satisfying whether or not they took place more than once in a lifetime. When one comes upon a strong aroma, say, walking into a house where bread is baking, or walking out one’s front door to the scent of osmanthus, if the stimulus continues for a time the olfactory receptors get desensitized or something; in any case, you stop noticing, until you go out and come back again. So I don’t know, if I had only smelled osmanthus once, if I could have made much of the experience. I’m not too good at paying attention, if that’s what’s necessary. But I’ve had decade s of being enveloped by the sweetness and the love that the Sweet Olive aroma signifies to me. I think I’ll just try to bask in it for a few seconds longer next time I pass by, or sit on the step and drink it in as long as my nose will keep sending the message to my brain. And if we move to a colder climate I’m sure I’ll be busy enough sniffing the air in that place without trying to import gifts that belong to the memorable past. I have a Sweet Olive too, but I had no idea what it was called or even how to go about identifying it! I know you'd prefer not to have your osmanthus crowding the house, but how wonderful to have the scent wafting in through the windows! Mine aren't quite close enough for that. Almost all my blossoms are off now. Thanks so, so much for helping me find out the true nature of my two trees. It's been a blessing. We planted a Sweet Olive by our front door in Virginia when we “relandscaped” (cut down a huge photinia that was harboring snakes) because I was still intoxicated by the memory of the whole town of Natchez smelling like sweetness when we went there for a friend's wedding fourteen years ago. I wonder how differently sweet and tea olive smell. Lately I learned that a common shrub here in MS with a soapy fragrance is eleagnus. (I may have spelled that incorrectly). It seems that tea olive and sweet olive are two common names for the same plant.